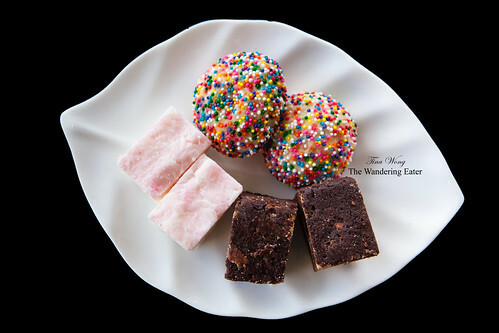 Waltzing Matilda’s is a bakery selling treats inspired by Australia and New Zealand. After a fruitless search for the traditional Australian and New Zealand pastries she fell for while attending the University of Wollongong, NYC-import Laura Forer began baking them in her Harlem kitchen. She now delivers the made-to-order delicacies citywide. Since I have eaten a few Australian desserts in NYC, I found them to be fine but nothing great. The sweets from Waltzing Matilda’s are pretty darn delicious and a few are unusual as I have never seen them before. 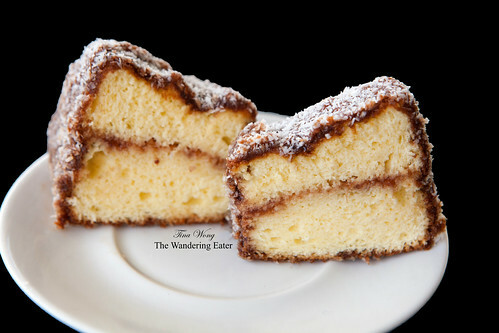 The lamington was a not too sweet, moist, large cube of yellow cake layered in tart raspberry jam, coated in milk chocolate frosting and sweetened flaked coconut. The light pink topped coconut ice was an rare candy to find in the States but it’s simply made of coconut, milk and sugar that would swoon the coconut admirer. The Hedgehog brownies are rich fudge brownies that has crunchy, crumbled biscuits that give it texture, probably implying its name. 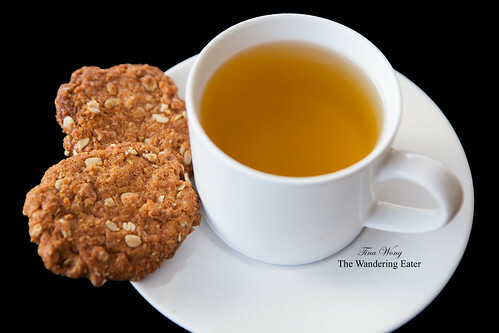 The rainbow nonpareils coated 100s & 1000s biscuits has the texture of the black & white cookie but a bit more buttery and crumbly and the Anzac biscuit is an oat-y, buttery cookie that’s fantastic with a cup of hot tea. 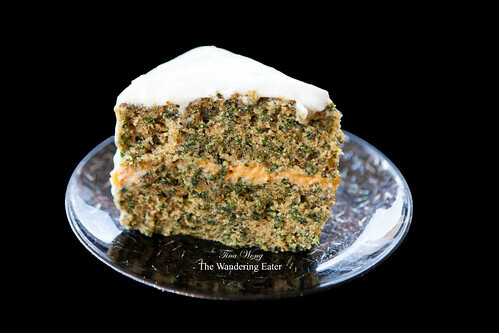 Moving toward the cake territory, the most unusual cake is the bright grass green kale cake with sweet potato custard filling and vegan cream cheese frosting. It does not taste as bad as you’d think. It’s delicious! Not too sweet and you would forget that this cake is practically healthy for you having that much vegetables in a cake. The passion fruit cheesecake is something my mother loves (I shared this cake with her). She loves cheesecake and passion fruit, so it’s a marriage made in heaven. 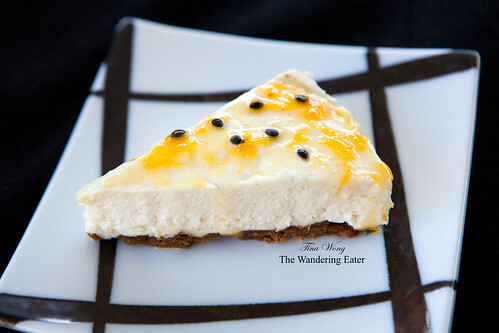 The cake was perfectly creamy and not too dense and the passion fruit flavor was vibrant and tart but just enough to cut the sweet, creaminess of the cheesecake. 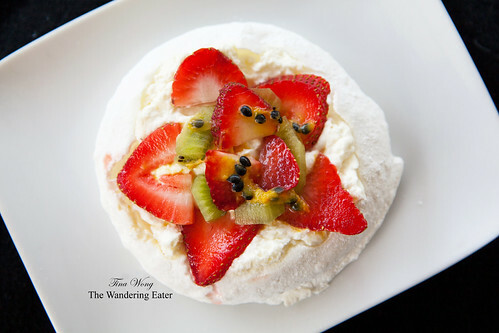 The pavlova is a familiar dessert and Waltzing Matilda’s version was great. Crispy, sweet, airy meringue melds with the lightly whipped cream and sweet fruits that you will not feel guilty eating this dessert. 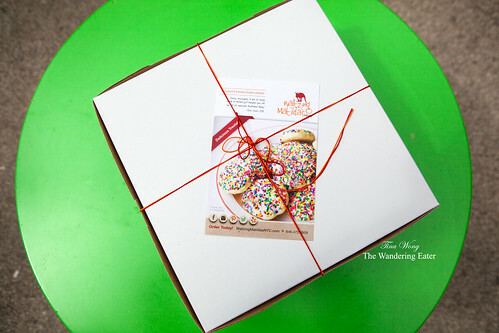 You will not go wrong with the desserts from Waltzing Matilda’s. I’m partial to the kale cake and pavlova but all the sweets I’ve eaten were delicious. 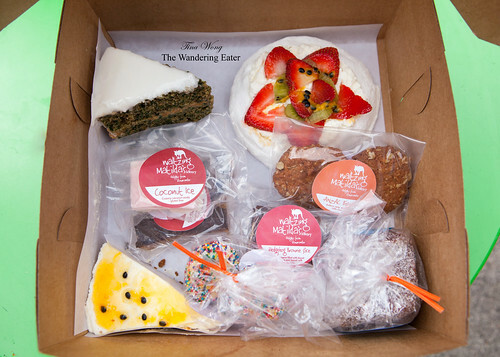 Order some of their sweets for any occasion since it’s not going to be an ordinary dessert.